On the hunt for the best slice? 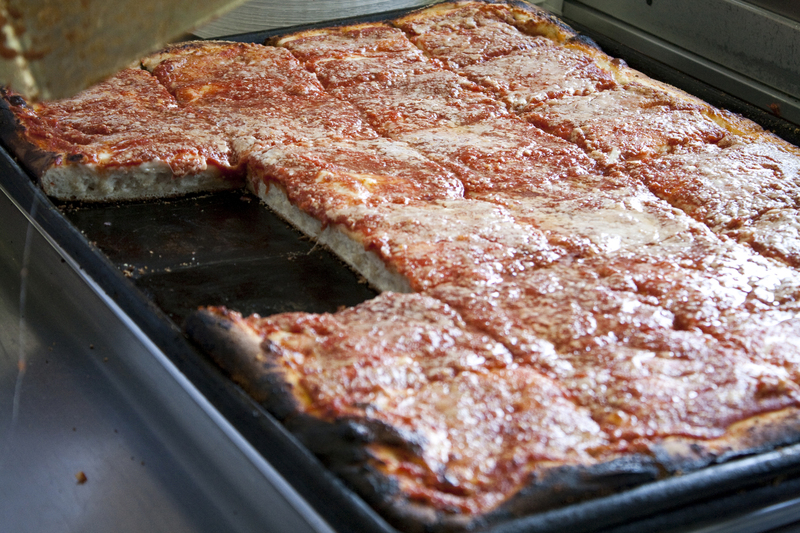 We sent a pizza expert across the five boroughs to find New York’s best slices and pies. We are fortunate we live in a city where the pizza is so good, even the dollar slices aren't half bad. Think of all the good pizza we eat in a given year. Yes, even the vegan and deep-dish varieties. Now think about all the good pizza we don't! It’s tragic. 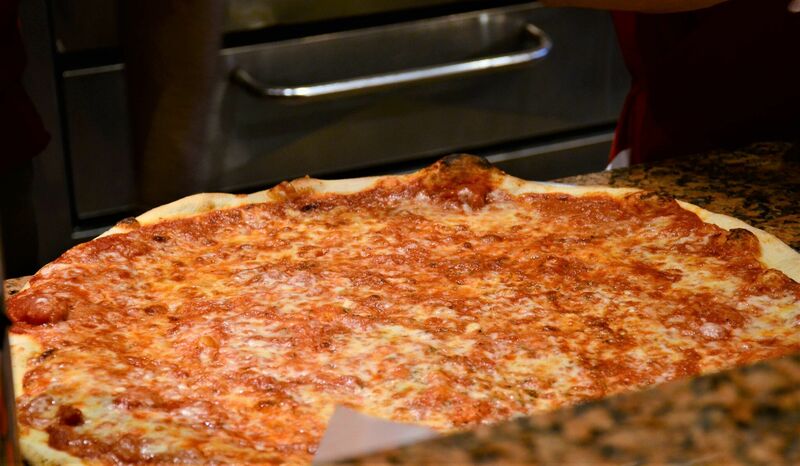 Among the best pizza in the world, most of it resides within our five boroughs. Whether you want to avoid long lines, be in the know about the next big thing, or give a new shot to an overlooked favorite of yesteryear, here is the best New York pizza you haven't had (yet). Armed with a tried-and-true coal oven, owner Patsy Grimaldi came out of retirement to to open his new Brooklyn Heights pizzeria called Juliana’s. He couldn't name it after himself because both his first and last name's were already taken by two of his biggest competitors: Patsy’s and Grimaldi's. This blistered beauty is a white pie topped with mozzarella, smokey scamorza affumicata, pancetta, scallions and oregon-grown white truffles in olive oil. Hidden in plain sight, NY Pizza Suprema greets Penn Station travelers in the shadow of Madison Square Garden. 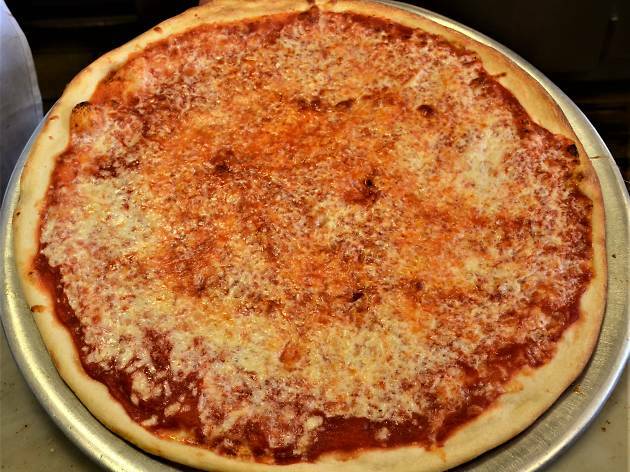 The chefs use the same family recipe since they opened in 1964 featuring some of the best cheeses from Italy and Wisconsin, perfectly ripened canned tomatoes from California, on a firm yet chewy classic New York crust. The never ending behind-the-counter dough tossing exhibition alone is worth the cost of the perfectly constructed slice. 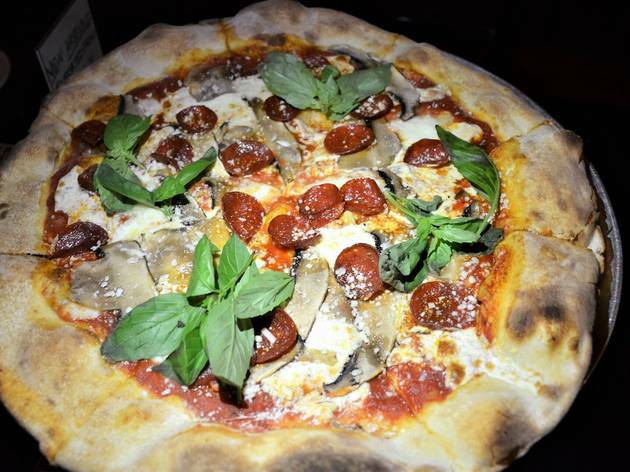 Owner and chef Mark Iacono takes to his dough as a sculptor to his marble, carefully crafting every pizza as if it were a one-of-a-kind piece of art. He adds fresh mozzarella and a careful mixture of sharp cheeses to maximize the flavor of each pie. The onions and mushrooms are skillfully layered in order to enhance, rather than overpower, the essence of the other ingredients. The end result is nothing short of perfection. Giuseppina's owner and founder Chris Iacono proudly credits his apprenticeship at his brother's pizzeria, Lucali, for his skills. Chris Iacono's use of top tier ingredients like a cheese blend consisting of low-moisture mozzarella, homemade fresh mozzarella, and imported Italian parmigiano reggiano, along with hand-cut pepperoni, fresh mushroom, Italian olive oil and fresh basil epitomizes Giuseppina's commitment to quality. The incomparable sauce comes from a secret family recipe passed down to the owner from his grandmother named Giuseppina. Topped with creamy mozzarella melted in cubes upon a rich bed of savory tomato sauce spread to the edge of a thin crisp crust, a Joe & Pat’s pizza takes simple ingredients and prepares them exquisitely. It’s a recipe that has been perfected over the past 50 years and we hope it never changes. And now, you can get a taste at the East Vilalge outpost. Paulie Gee loves good pizza. So much so that he dedicated his retirement to the art of pizza making. Using freshly grown basil, homemade fresh mozzarella, and a secret tomato source, Paulie perfected an entire recipe book in his very own backyard (that backyard contains a wood-fired brick oven that he built himself). Expect him to sidle up to your table for a chat about the pizza. 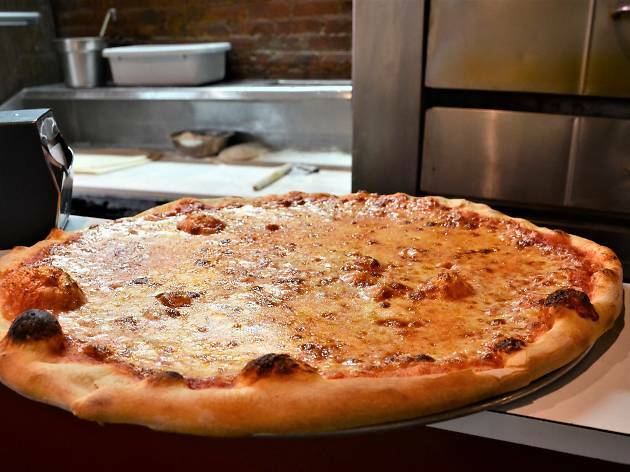 Rubirosa is pizza royalty: The founder is of Joe and Pat's fame—he is the son of the owner of the Staten Island institution. The Rubirosa Supreme creates a salty-sweet medley by combining hand-cut spicy pepperoni, diced basil, and flavorful meatballs atop a firm crust that is both strong enough to withstand the weight of the ingredients and yet soft enough to fold like a typical New York slice. Di Fara is the Mecca to which all die-hard pizza lovers should make a pilgrimage. It won't be on your way somewhere. You will wait a lot to be served then pay a lot to get your slice. You will either have to wipe down your own table or you won't even get one. But the amount of care and the quality of ingredients makes each pizza worth it. Anthony "Totonno" Pero began making pizza at Lombardi's back in 1905. After distinguishing himself as a master pizzaiolo, Totonno opened his own pizzeria in Coney Island in 1924. It still stands in the same location and is still run by the same family. True to its philosophy, only top quality ingredients are used here, including imported Italian olive oil, homemade mozzarella and savory tomato sauce—all cooked in the 600'F coal burning oven. 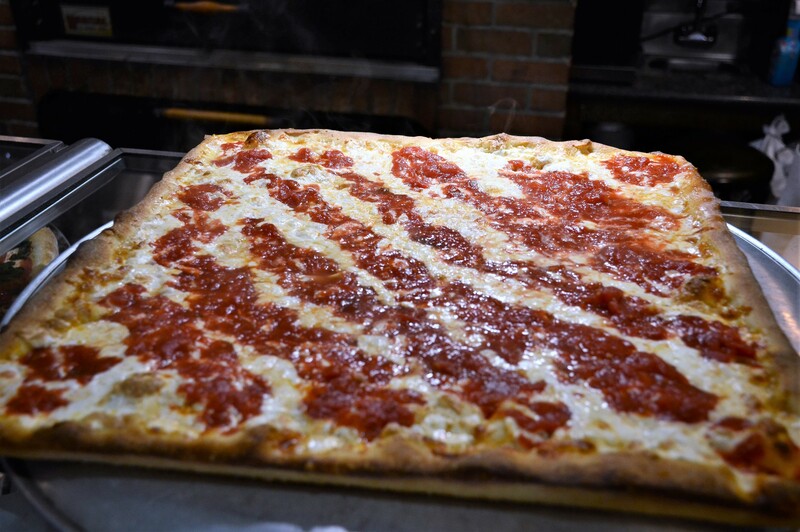 Known for its crisp Sicilian pie, Rizzo’s has become an institution in Queens since 1959. Since then, the menu has expanded but it’s the Rizzo signature slice: the thin crusted “Sicilian," that will keep you coming back. The recipe includes copious amounts of rich, tangy tomato sauce with a single slice of creamy mozzarella, flanked by bits of sharp and mild, grated cheeses. 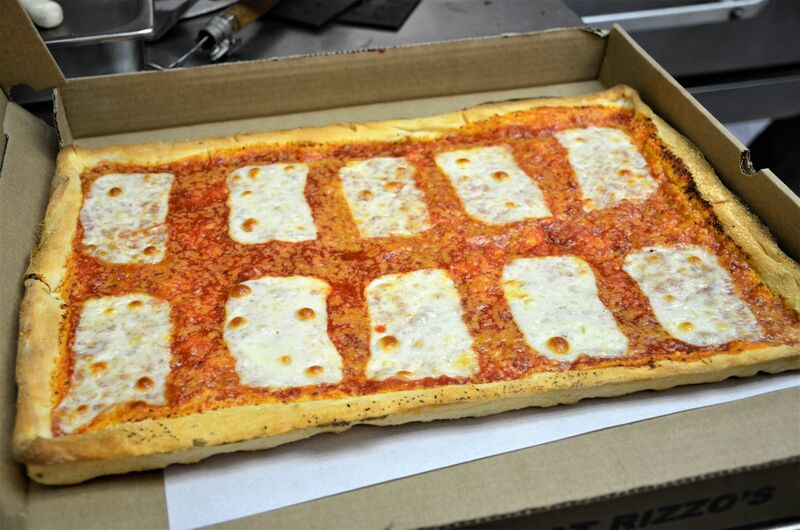 All of these rest atop a thin, crispy gas-powered oven crust. Louie and Ernie's pizzeria is frankly adorable. 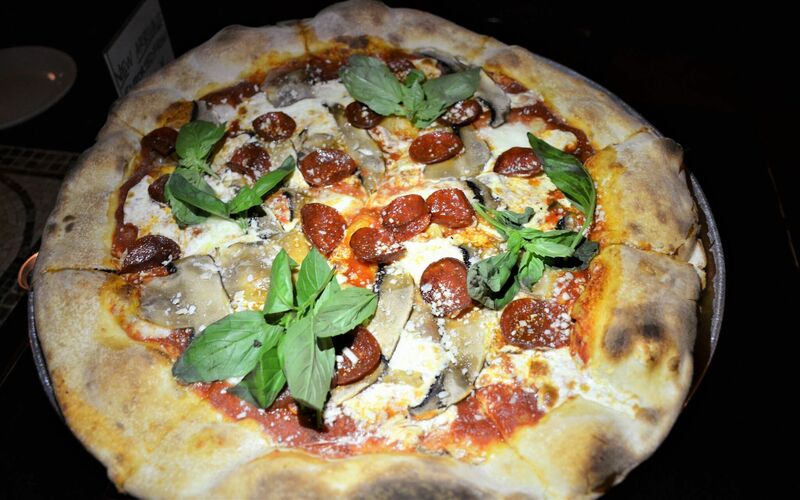 The staff is friendly, the ambience is warm, and most importantly the pizza is delicious. Catch a glimpse of the heavily Bronx-accented teenage pizza chefs precociously preparing pie after pie and you'll notice something more than wise-beyond-their-years pizza knowhow: pride. The staff is clearly proud of their product and the Louie and Ernie legacy. One visit and you'll be proud of yourself for discovering it. 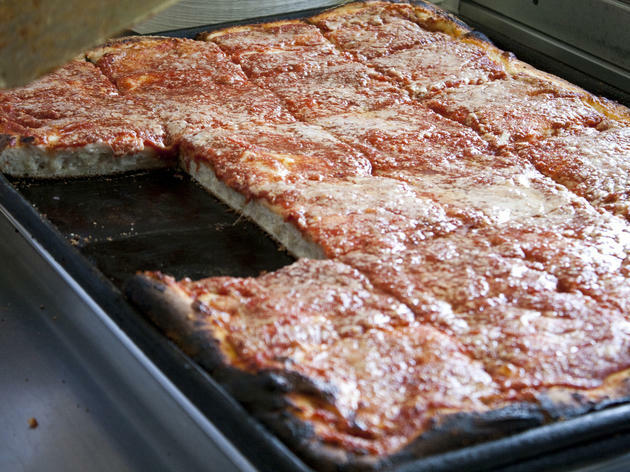 Since 1939, this Bensonhurst original—where muscle-bound Brooklynites with deep accents gather in the outdoor patio—has served one of the best Sicilian slices in town. Candy-sweet tomato sauce is generously slathered over tall, doughy rectangles with a crunchy browned bottom. It’s finished with squares of melted mozzarella and zippy strands of Parm. Arturo’s does it all. Two huge, painting-lined back rooms allow Arturo’s coal-oven pizza the flexibility to feed larger parties, while the bar and live jazz at the entrance sets a romantic mood perfect for a dinner for two. The Arturo’s Fiesta Pizza combines a savory Italian sausage with peppers, mushroom, and onion to complete the already tangy tomato taste in an Arturo’s pie. While there are several pizzerias that share their name, only the original one was opened by Pasquale “Patsy” Lancieri and his wife, Carmella, in 1933. The East Harlem locale is still owned by the families of the former employees. The meatball pie is topped with just-right amount of rich tomato sauce, creamy low-moisture mozzarella cheese and homemade meatballs on a firm yet crisp, perfectly charred crust. Plus, it's the only place that serves coal-fired brick oven pizza by the slice. Among the graffiti covered warehouses, you'll find a caged-up window, dirty ATM, and a cursive sign reading "Roberta's." Fear not, for you have arrived. Regardless of whether or not you categorize the "urban art" as art or the work of vandals, Roberta's pizza is an undeniable masterpiece. 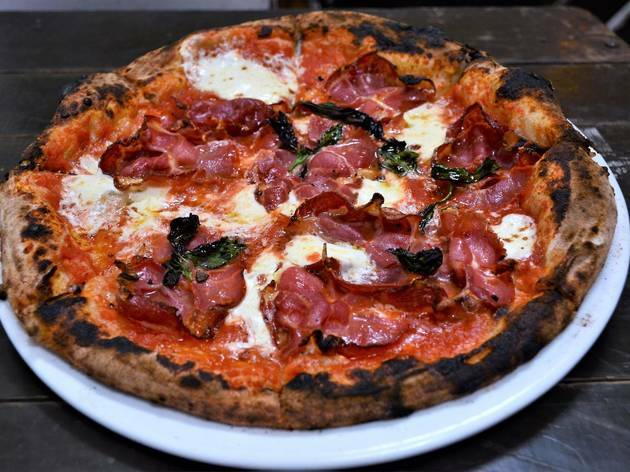 The red onions and smoked prosciutto on the Speckenwolf will take you on a magic pizza ride that will delight your tastebuds and make you glad that you decided to take the trip. Not surprisingly, Manhattan's newest "best" pizza has been one of Brooklyn's favorite for over 65 years. 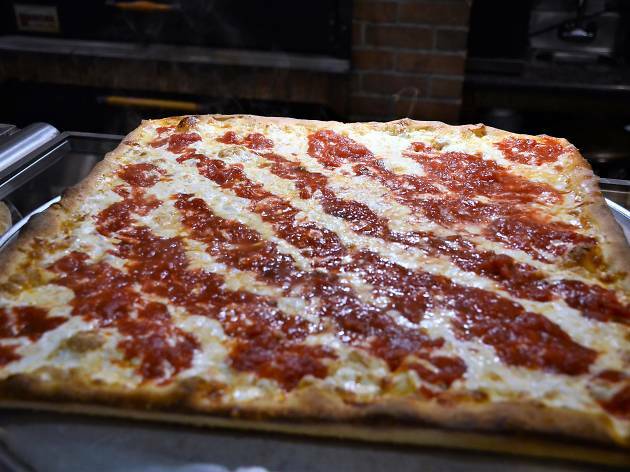 Tommy Degrezia, grandson of iconic J&V Pizzeria founder Vinny Degrezia, created Sofia Pizza Shoppe to save residents of Midtown East a trip to South Brooklyn for an authentic New York street slice. 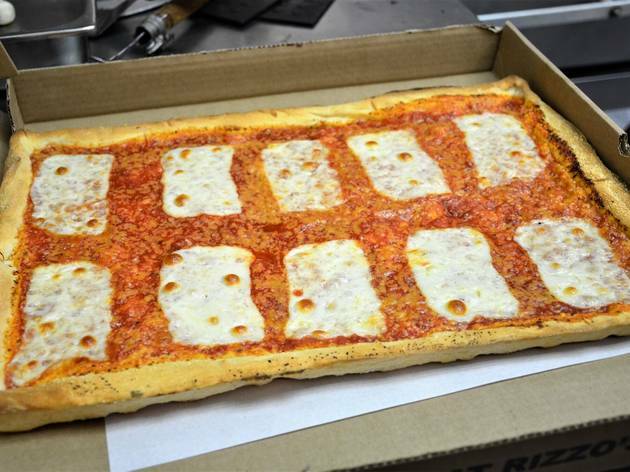 The twice-baked, rich tomato sauce-laden Sicilian grandma style (a mouth-watering replica of an L&B square slice) offers a solid base for Tommy’s unique pizza inventions. College chums Todd Feldman and Justin Bazdarich had long dreamed of joining their creative and culinary skills and opening up a restaurant together. Lucky for them, and luckier for all of us, their dream has become a reality. Speedy Romeo's Saint Louie pie bursts out of the gate delivering non-traditional provel cheese (a blend of provolone, Swiss, and cheddar) with savory pepperoni and sausage and pickled chilis for a swift kick of flavor. 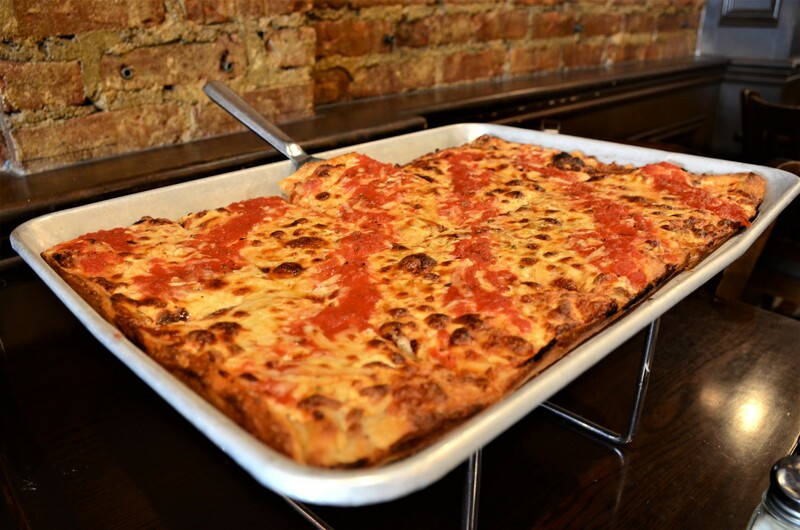 Thanks to Emmy Squared, you can get a taste of Detroit-style pizza in Williamsburg. Their homage to the style includes the characteristic topping-centric, twice-baked, rectangular deep dish pies. The Roni Supreme combines hand-cut pepperoni and Calabrian chiles for a tasty zing and a memorable sting with every bite. Beneath the toppings on each pie lies a golden-brown melted cheese, which provides a tasty foundation and crunchy texture to the surprisingly filling slice. Nine years ago, Anthony Mangieri took Una Pizza Napoletana, his popular East Village–via-Jersey pizzeria, and shipped it to San Francisco. Well, if you love something, set it free, because Una Pizza has returned to its rightful home. The menu sports an array of 12-inch pies, each $25 and free of any exotic toppings. The star is the Filetti pie: a chewy and airy crust topped with mozzarella, fresh, sliced cherry tomatoes, garlic and basil. 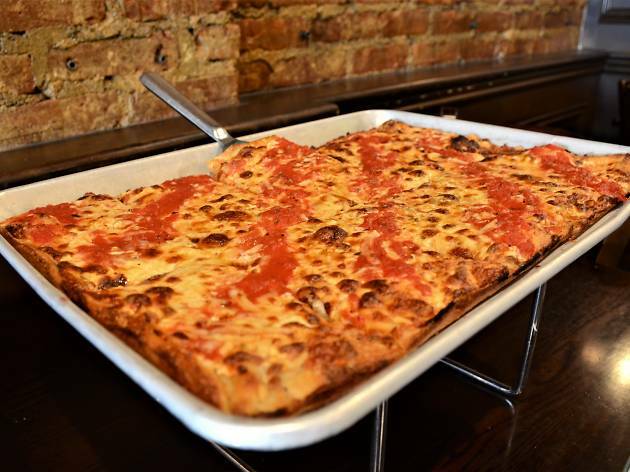 Emmett's has a lot of nerve bringing Chicago-style pizza into New York. Knowing this, they only brought the good stuff. If you have already decided that deep dish is offensive, go for the “Bar Pie.” The super thin crust loaded with creamy Wisconsin mozzarella and hearty Midwest sausage is cut "tavern style" into squares of savory pizza bliss—a perfect marriage of the First and Second City. Chances are, if you have been to the Brooklyn Flea and were blown away by the pizza served in a mobile oven, you have tried Pizza Moto. Good news: Moto has found a home at the edge of Red Hook and Carroll Gardens. 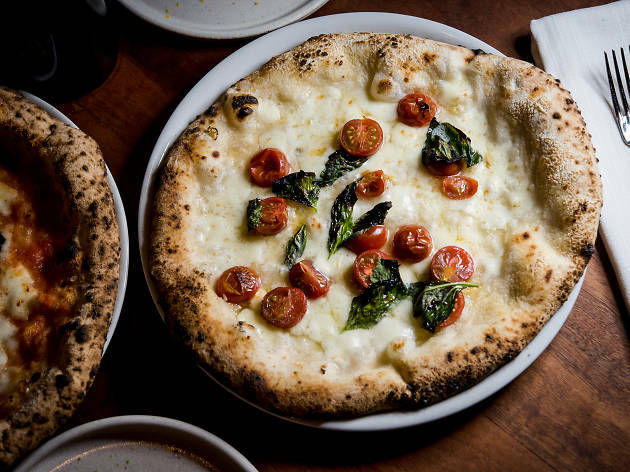 Even better news is that deep inside the new digs exists a century old coal-burning oven that has been retro-fitted to churn out that characteristically wood-burning, perfectly crisp, charred crust of a Pizza Moto pie. Like an artistic oasis in an otherwise urban landscape, Saraghina brings a foreign flare and a fantastic flavor to Bedford-Stuyvesant. Named after a character in the film 8 1/2, Saraghina churns out pizza that exceeds 8 1/2 on any taste scale. The Italian-accented chef ensures the perfectly charred crust supported the crushed tomato sauce and fresh mozzarella cheese. The capocollo (cured pork) provides a nice savory kick to what is already out-of-this-hemisphere delicious. 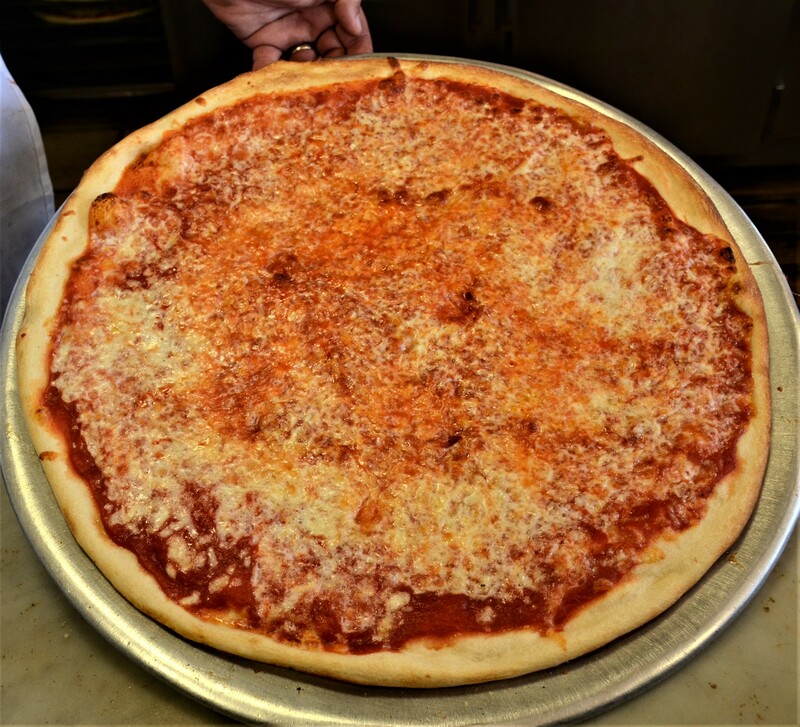 A Staten Island institution since 1937, Denino's has been pioneering pizza innovation for over eight decades. Layering the perfect amount of hearty meats including homemade sausage, savory tomato sauce and tasty veggies, the Garbage Pie embodies the ideal supreme pizza that well-known pizza chains strive so hard to imitate. 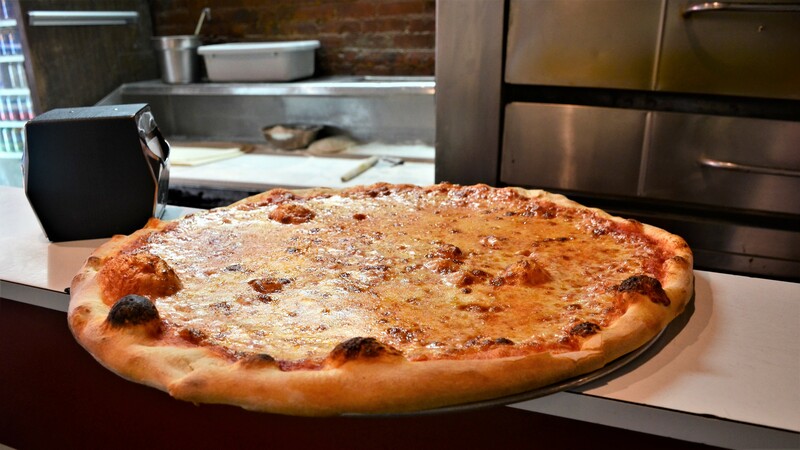 There is nothing like the real thing and Denino’s proves it with every pie. 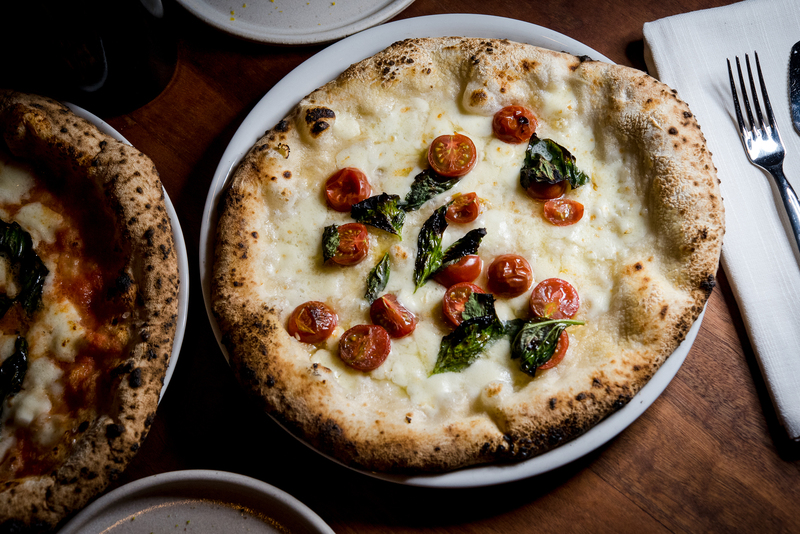 This Astoria restaurant is named as an homage to Antica Port'Alba, arguably the oldest pizzeria in the world. The Old Fashioned Grandma Style Square Pie is big enough for a family—the cookie sheet-shaped pizzas are loaded with four types of high quality cheeses, savory San Marzano tomato sauce, extra virgin olive oil and oregano, then twice-baked in a gas-powered oven yielding a crust that provides a sturdy foundation for the toppings without feeling too heavy. If you love ample amounts of rich sauce and oily cheese set on a thin crisp crust, that's Amore. The decor of the kitchen and dining area retain the homey style of a stereotypical city pizzeria with its tight quarters, colorful juices swirling in their dispensers, and a greasy menu board lacking several letters. Tasty and consistently delicious in its simplicity, it's no wonder loyalists have been frequenting this place for decades. If US News & World Report ranked college pizzerias, Pugsley's would have to be ranked #1: Inexpensive, convenient and open late. Order a full pie, and you're invited behind the counter to bang a suspended gong. According to a sign penned by owner Sal, who is as eccentric as he is Italian (and he's very Italian), you are to associate your goals with the sound of the gong. If your goal in life is to eat Pugsley's pepperoni pizza, it’s a win-win. Milkflower is more than an Astoria pizzeria; it's a gallery where everything is art and it's all on display. From the imported wood-fired brick oven to the brightly-lit dining area to the garden out back, and, finally, the pièce de résistance: the pizza. The “milk flower” is made in house and featured on the egg-and-Brussel-sprout-infused Van Dammer. Expect a well-prepared, oven-kissed piece of art every time that is almost too beautiful to eat. 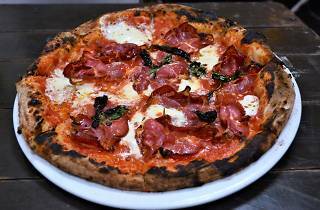 The Italian translation of this Gowanus restaurant is “pizza cooked well.” It’s an understatement. Layered with rich cooked tomato sauce, locally sourced fresh mozzarella, and garnished with just the right amount of herbs and spices, the Grandma Josie pie satisfies both your tastes buds and your appetite. Spreading these top quality ingredients all the way to the rectangular edge of the twice-baked, gas-powered crusts ensures flavor with every bite. 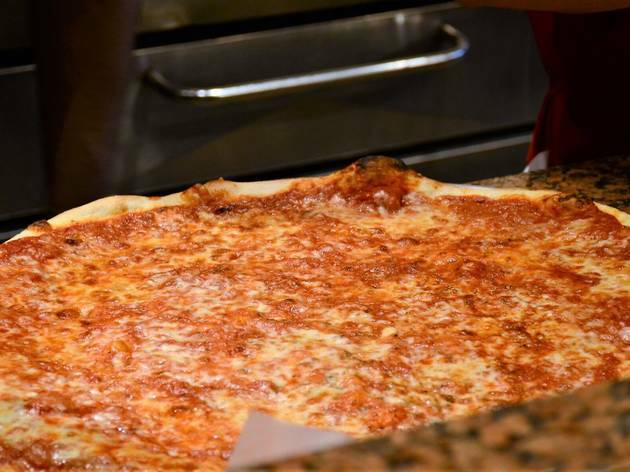 It's tough to find a reliable slice joint on the Upper West Side. There is only one: Sal and Carmine. Salty, crusty, and stiff on the outside but soft and warm on the inside is the best way to describe both the pizza and the pizzaioli that craft it. The gruff demeanor of the staff and no frills dining area with its strict 20-minute seating time limit only add to its "charm."